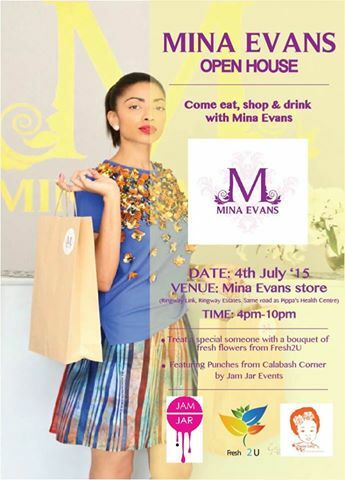 Fashion Icon Award 2015 brand of the year award winner, Mina Evans invites you for discount sales. The one day shopping spree scheduled for July 4, 2015 at the brand's store located at Ringway Estate, Accra. Pass by at Mina Evans Open House and pick up some great ready to wear items for Women, Men and even little ones, with 15% off all day. The shop opens from 12.00pm but the event starts at 4.00pm-10.00pm. Fresh2U Ghana will be there with their beautiful flower bouquets and Jam Jar Production providing refreshing punches with calabash corner. DJ Pam Bam will be on the decks providing some chilled out music to provide the perfect atmosphere.